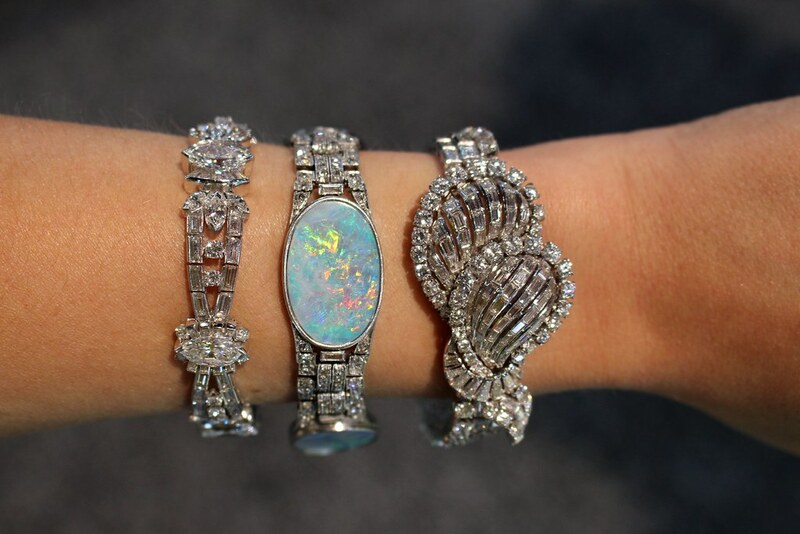 This was the second year that the Las Vegas Antique Jewelry & Watch Show was located at the Las Vegas Convention Center, and will be it’s new home from now on! Next year AGTA will also be in the same building, so there will be antique jewels AND incredible gems! This year’s show was lots of fun–I spent two back-to-back days mostly focusing on taking photos, meeting new people and of course buying! The second day I had an on-camera interview that I did in conjunction with the show, which I’m excited to share soon. This year’s reoccurring theme for me was bracelets! I kept being drawn to bold bangles, cuffs, tennis bracelets of all sizes, eras and price points. You could probably tell from my recap photos–I shockingly have more bracelet wrist stack photos than my typical Show Me Your Rings shots. I did notice that an abundance of bracelets were present at the show…and rings were slightly lacking. It could obviously be due to the demand of rings, as most people tend to buy rings, with some shops even exclusively selling rings only. If you attended the show, did you notice that too?? I’d love to hear.